Wish We Were Here. | 50 Westerns From The 50s. 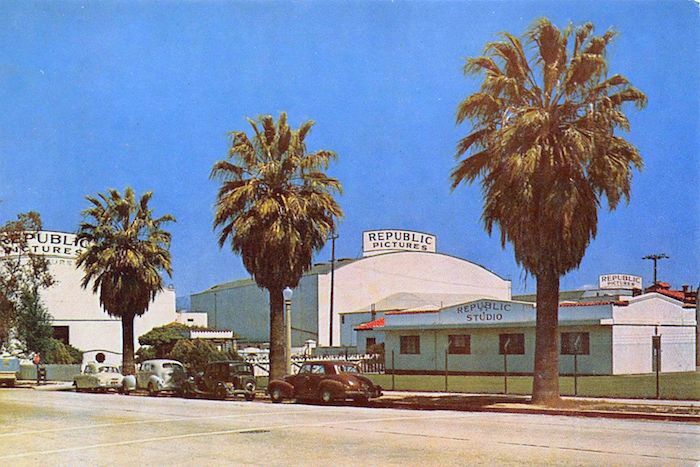 Came across a postcard of Republic Studios. Judging from the cars, I’d guess it’s from the 40s. Republic Studio, North Hollywood, Calif. Known as the friendly studio, Republic covers about 70 acres, has 18 sound stages and employs 3,000 people during the peak season. 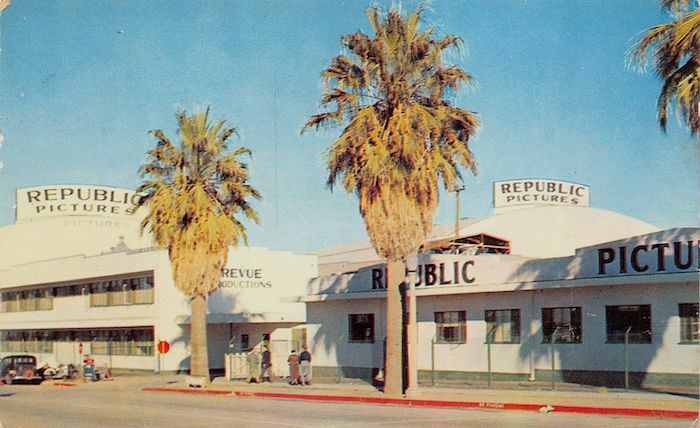 Republic Pictures, the little studio that could. The movie heritage of Herbert J.Yates and Republic Pictures will always remain a vital part of American movie history. I’ve been celebrating Republic in my own little way the past few days by watching some Three Mesquiteers, interspersed with some later Rex Allen films. They were top drawer studio for these B-westerns. Last week I watched the ADVENTURES OF CAPTAIN MARVEL(1941) serial, which was directed by William Witney and John English. I first saw it on TV in the 1960’s and thought it was outstanding. In the 1990’s I bought the VHS video and now I have it on DVD. I still think it is outstanding. Frank Coghlan, Jr. as Billy Batson then “Shazam!” we have Tom Tyler as Captain Marvel. Stuntman David Sharpe does the leaps and landings in realistic style. In my opinion the flying scenes were the best until the 1978 SUPERMAN with Christopher Reeve. Republic’s Howard and Theodore Lydecker came up with excellent special effects. I agree, Walter. “Captain Marvel” (1941) is one gem of a serial. I’m so glad that Kino put it out on blu, alongside the also excellent “Daredevils of the Red Circle” (1939). Republic was really going great guns on their serials back then, although they soon fell into a pretty doggedly cookie-cutter pattern. Another Republic serial I particularly love is “Hawk of the Wilderness” (1938) with Bruce Bennett, when he was still billed as Herman Brix. Might even be my favorite Republic serial. Gorgeous location work, in this ersatz Tarzan-type adventure. There’s some news that VCI is coming out with two of Buck Jones’ western serials in May… both Universal productions, however. “The Red Rider” (1934) and “The Roaring West” (1935). The first might indeed be my favorite western serial. A lot of texture and characterization in it. Far more than usually found in such things. Western stalwart Edmund Cobb has a really nice sidekick role, and Marion Shilling a pleasant heroine. I’m really, REALLY hoping VCI has obtained a solid, sharp print of this one, as the long-circulating ones have been a bit rough. The second Jones serial, “The Roaring West,” is not nearly as good, as I recall. Lastly, VCI also has the Universal sci-fi serial “The Vanishing Shadow” (1934) slated for blu in June. It’s great fun, if admittedly a bit wacky, involving an invisibility belt, ray-guns, a mad scientist (who is actually an ally of the hero), and a robot that goes on a wild rampage. Stars Onslow Stevens. I’m hoping again for a big upgrade in print quality, as the Blu-ray cover does state it’s sourced from 35mm. Guess I’ll find out in a few more months. Bert, thank you for sharing sharing this good information on upcoming releases of Buck Jones Western serials. I’ve never seen these and I would like to. THE VANISHING SHADOW does sound like a fun Sci-Fi. Is the DVD of ZORRO’S FIGHTING LEGION(1939) at VCI from a good print? This serial is another good one from Republic starring Reed Hadley. This Witney/English gem is packed with canyon to canyon action. I still have my old VHS video. You know, you pose a question I’ve had myself. I have the official Republic copies of “Zorro’s Fighting Legion” (1939), along with “Zorro Rides Again” (1937), and “Zorro’s Black Whip” (1944), and I had them transferred to dvd. So I really didn’t have any need to try out VCI’s copies. I frankly assumed they might be a bit sub-par, in a similar way their “Undersea Kingdom,” another PD title, was well below the quality of the Republic tape release. Naturally, because the latter had access to far better elements. Now on happenstance, I did get a copy of Roan Group’s dvd of “Zorro’s Fighting Legion,” but I was a bit disappointed in the quality of it, which surprised me, because they otherwise had a history of some really good quality prints and transfers on many things. Including another Republic serial, “SOS Coast Guard” (1937), which looked excellent. I know serials can be an acquired taste. Although I grew up with a passion for old movies of all kinds, I didn’t really see much serial fare until I was college-age and beyond, and truthfully it took a while before I fully cottoned to them. It seemed to take a few years before I acclimatized myself to some of their quirks, but once I did, I developed a real love for them. Even the bad ones, to varying degrees. But I know they can be a tough sell for many. Glad you mentioned these VCI serials, Bert. I’ll be doing first-chapter commentaries for all three. What a great time to be living in Southern California! Hey Toby! I’ve been ignorant of the fact that you have done a lot of film commentaries! How did you get started? Can you name a few off hand? Looking forward to a listen! I discovered this wonderful place of yours, here, awhile back when ONE EYED JACKS was re-released. Probably in the running for a claim to be the films’ #1 FAN– I’m really looking forward to your book about the filming of JACKS , which has remained my FAVORITE WESTERN since it’s first 1961 debut .Naturally, I’ve ALWAYS held on to the fantasy, that ALL, or SOME that million feet (or so) of film Marlon shot -would be restored someday, and was ,hoping along with everyone else that this restoration would find and include some of that footage from his directors’ cut(s)–although I pretty much had come to the conclusion since the beginning that it was thrown away and THAT ,of course, found it’s tragic conclusion of truth.. One would think MARLON could have personally saved some of it, somehow, himself.. Burt Greene: I have the Echo Bridge release of the serial ZORRO’S BLACK WHIP , and the chapters seem short. Do you know if this DVD is an edited cut-down? It’s the ONLY serial I have, an old childhood matinee memory and I accidentally found it in a bin of DVD’S-on-sale somewhere! Thanks to all! Don’t think we’ll ever see a reconstructed version of One-Eyed Jacks. Scorsese once approached Brando about it but he wasn’t interested. Sorry to be a downer. One of my goals with the book is to cover how it was supposed to play out. It’s fascinating stuff. I’ve rounded third on it and have 25% of it being looked over by some writer friends. Got some good news today — the NRA museum has helped put me in touch with the prop company that has the pistols Brando used. Will get some extra info on those soon. It’s funny, but the closer I get to finishing this thing, the more stuff keeps turning up. I don’t have the Echo Bridge version of “Zorro’s Black Whip” (1944), so I can’t state anything for sure. But this was around the time Republic’s chapters became shortened to around 14 minutes. The first chapter would be longer, like around 20 minutes, and the subsequent episodes in that 14 minute range. Bert, thank you for the good information. I probably need to get to work on transferring some of my VHS tapes to DVD. During the late 1980’s I transferred my Beta tapes to VHS. My DVD of SOS COAST GUARD(1937), which is directed by William Witney and Alan James, is from Vintage Home Entertainment and released in 2003. Sounds like the Roan Group did a better transfer. Yes, for many individuals, serials can be an acquired taste, but I have always enjoyed them. I was first introduced to serials as a youngster during the 1960’s. There was a children’s show titled ADVENTURE TIME with Cap’n Bill Killebrew on ABC Affiliate WHBQ-TV Channel 13, Memphis, Tennessee. He showed several of the wonderful Republic and Universal serials. Kids got to see serials for the first time on TV and they liked them. As adults we turned out to see RAIDERS OF THE LOST ARK(1981).